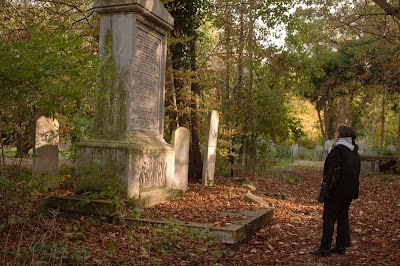 Known locally as Bow cemetery (although officially it is London Tower Hamlet Cemetery) opened in 1841 is one of the most important Victorian working class cemeteries. Prior to this period graveyards were small and generally attached to a church. This is one of the seven large cemeteries created during the Victorian era. Important as it is steeped in east end history. From large unmarked communal graves to those of numerous disasters such as the Bethnal Green tube disaster in 1943 were people were crushed sheltering from the blitz. It became a nature reserve in 2001. While wandering through here I found mushrooms saw a red fox run by and generally found it a wonderful place to explore. Haven't been to this cemetery, but I bet my late mother-in-law would have known it well. She shared my love of cemeteries and was brought up in the east end. Always great places to get close to nature & have moments of quiet reflection. Thanks for sharing this! What a lovely fall photo! We have a few lovely old cemeteries to walk around here in Montreal too, although ours are so big they're still in use today! They really are wonderfully peaceful places and I always enjoy reading some of the older tombstones to see the dates and the names of the people. They knew how to memorialise in style in those days. Graveyards are extraordinarily peaceful and poignant places and certainly give pause for thought. How unusual is it, I wonder, for a cemetery to become a nature reserve? Great idea, though. What a day you could spend walking through there. It would be so hard not to stop and read each marker. It looks a bit solitary but so beautiful. A nature reserve in the middle of a big city like London. Unthinkable in other parts of the world.But London is unique for its green areas, isn't it? A red fox? What a lovely meeting! I love visiting a cemetry. I know that sounds a bit grim but I find them facinating and I love that they have so much history. Everyone there could tell a story, if they could. definitely a place with a soul ! Walking in a place like this must be wonderful now, watching the wild animals and enjoying nature. A very special post. Have not been there since childhood, my grandparents lived not far from here and in the summer we would visit for a couple of weeks. Even as a boy I thought it was an interesting place. Fall, fall, fall in that photo. wonderful - I have never visited it, and i love cemeteries.